While you can never go wrong with roses or a dinner date, nothing captures the eye of a loved one quite like the sparkle of new jewelry. 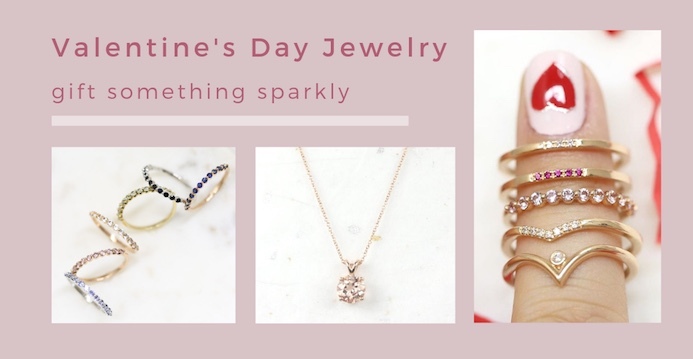 With Valentine’s Day just around the corner, now is the best time to start researching the perfect jewelry for the occasion, whether it’s for your spouse, girlfriend, or just that special someone. But with so many options available online, it can feel overwhelming just knowing where to start. After all, everyone has different preferred styles, so you’ll want to get something that suits their specific taste or personality. Buying jewelry can be tricky because each person can be particular about their preferred style, color, and types of jewelry that they wear. If you don’t already have a feel for what your loved one may fancy, start by doing some research. Observe the jewelry she already wears, and ask why she loves that specific ring or necklace. Consult one of her friends for some advice, perhaps someone whom she tends to go shopping with. By understanding the choices made behind her existing collection, you’ll be in a better spot to choose jewelry pieces fit for her taste. What’s the difference between pink and rose gold? What are the most popular cuts of diamond? What does VVS stand for? Before making the jump and purchasing jewelry, it’s important to understand some common terminology and concepts — this will make it easier to find exactly what you’re looking for when you come in for an in-person consult or search Valentine’s Day jewelry collections online. For something she’ll really treasure, consider buying something that connects to her personality and identity. Find a gemstone with her favorite color, or find a ring with her birthstone. To make it even more unique, consider creating a custom design ring, so she can have something one of a kind. If you want to have a little fun, try injecting a little creativity in how you present the gift. Maybe you could add a love letter or a matching outfit. To make it a little lighter, try using joke packagings, such as a cereal box or a coffee tin. If that’s a little too much, you could try sending your loved one on a little scavenger hunt throughout your home and end up leaving it somewhere in plain sight. Switching up how you present the jewelry can be far more interesting than simply handing it over in a bag. Valentine’s Day is one of the biggest holidays, and one of the busiest. Don’t get left behind waiting for jewelry to arrive a week after the date has passed. Do your research quickly and put in that order as soon as possible! The longer you wait, the riskier it gets, and the more likely your order will get pushed back due to holiday logistics. Fortunately, some places offer Valentine’s Day express shipping or jewelry that is already ready to ship. You’ve been together for a few years now, and each year, your relationship only grows stronger. You’re still not ready to ask “the big question”, but you want to make this Valentine’s Day just a little bit more memorable than the last. The Rosados Box Donna Sterling Silver Gold Plated Round Morganite Leaf Gallery Basket Solitaire Necklace captures the beauty of the holiday in a solitaire pendant necklace featuring a pinkish hued morganite that your loved one won’t soon forget. This ring is for the couple that is ready to spend the rest of their lives together. The wedding may still be a year or two away, but this Valentine’s Day is the first step to a longer and more serious commitment. The Rosados Box Cinderella 10x8mm 14kt Rose Gold Oval Morganite Diamonds Cluster 3 Stone Engagement Ring has all the elements of an unforgettable engagement ring, from the oval cut to the pink morganite. For the married couple that has stuck together through thick and thin and through decades of change, this half eternity band says it all. The Rosados Box 14kt Rose Gold Matching Band to Kubian 7mm /Samina 7mm Diamonds ALMOST Eternity Band features the classic eternity band with a twist while symbolizing the true love between two people. Valentine’s Day is a special day meant to be spent with a special person. We understand how challenging it can be to find the most perfect piece of jewelry for your loved one to express exactly how you feel. If you need help in exploring our collection, feel free to contact us today.